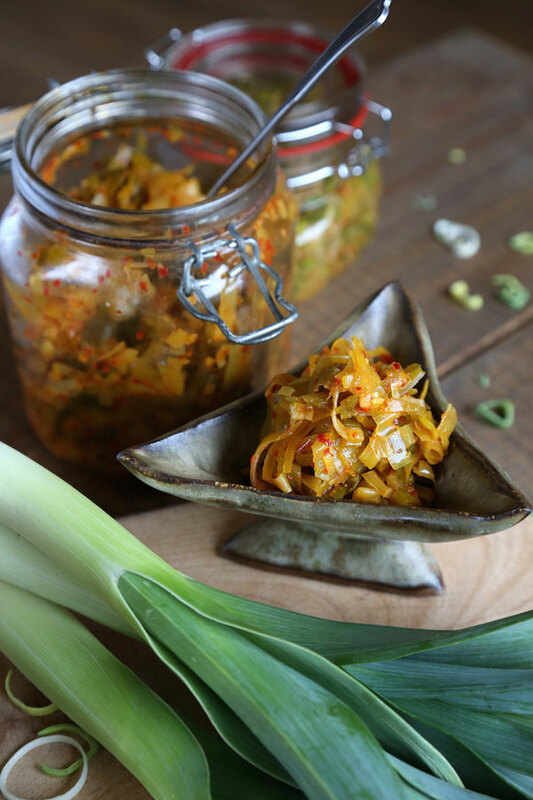 I’ve been known to polish off entire jars of kimchi in record time, so when I first heard of kimchi’s leek-based cousin, my curiosity was piqued. 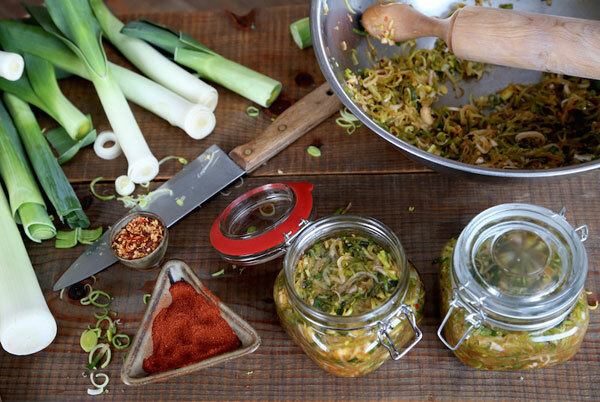 Each year, I make as many batches of sauerkraut and kimchi and various other lacto-fermented veggies as I can muster, with all kinds of variations on the themes. It can get rather experimental, as were this fall’s lacto-pickled kohlrabi and eggplant (the first was delicious, the latter not so much). 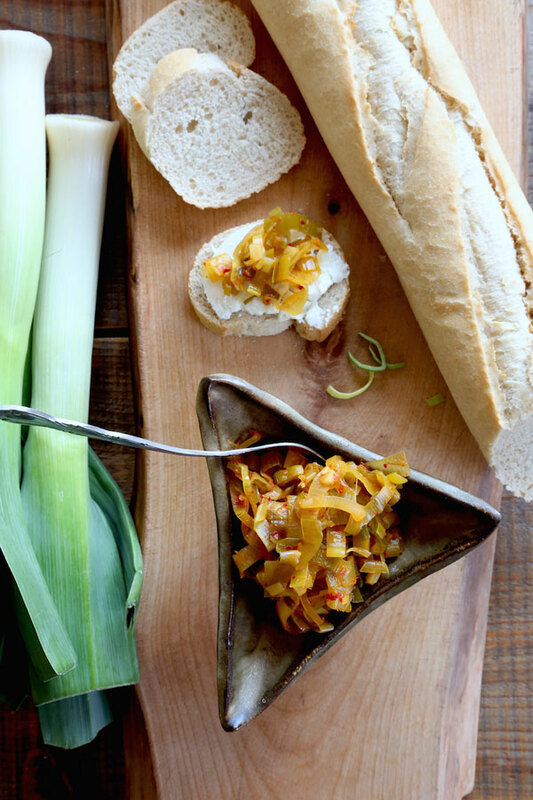 But until I read a beautiful feature on leekchi in Taproot Magazine, I had never thought of experimenting with leeks. It was a revelation. My friend beat me to it last summer and then generously shared a jar of her homemade leekchi. I ate it on everything for days on end until the sad day came when I peered into the jar and realized it was all gone. So this year, I vowed to make leekchi in large enough quantities to keep myself well stocked for as long as possible. I just can’t seem to tire of the stuff. I eat it with scrambled eggs, on toast, on cheese and crackers, in sandwiches, next to rice, I’ve put it in soups, stir-fry’s, and wheat berry salads. It adds indescribable salty spicy umami goodness to every dish I’ve used it in. 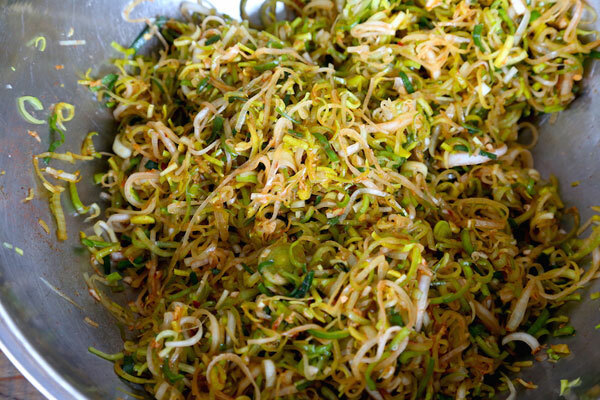 We could all use a little more facto-fermented foods in our diets. In the last few years, a growing body of research is showing the incredible benefits of increasing our friendly gut bacteria. Eating fermented foods (such a yoghurt, kefir, sauerkraut, and yes, leekchi!) has been shown to help our digestion, reduce our risks of diseases like cancer, and even improve our emotional health! And while it may seem like a far-fetched claim to say that fermented foods can reduce our anxiety and boost our moods, that claim is now being backed up by scientific research. People of different cultures around the world have been eating fermented foods for eons. The bottomline is, we need lots of friendly bacteria in our gut in order to have good overall health, and in our current era of uber-cleanliness, heavy antibiotic use, and pesticide residues, our poor little gut bacteria are constantly under attack. I won’t go into all the specifics of lacto-fermentation because entire books and websites are devoted to the topic, but I do want to say that there are many, many different techniques and vessels that will yield successful ferments. 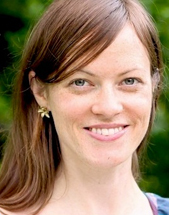 There is even a fair bit of controversy surrounding which method is best. Bottomline is, so long as vegetables are submerged under liquid in an oxygen-free environment, successful fermentation should occur. This article goes over some of the ways to ensure submersion. You can use a traditional crock and weights or a simple mason jar (loosening the lid every day to “burp” the jar and allow the gases to escape). These methods will sometimes produce a thin layer of mould on top that is harmless but should be skimmed off the surface. I’ve always been a bit turned off by the potential of mould, so I recommend using an airlock system, such as Pickl-it or Go Ferment. A cheaper option is to use clamp-down jars with rubber gaskets and metal clasps, such as Fido or LeParfait. The clamp-down jars do pose a small risk of shattering from the build-up of gases and pressure and though this has never happened to me or anyone I know who uses this technique, I’ve heard it does occasionally happen and it sounds pretty scary. When I use this method, I wrap my jars in towels and tuck them in a closed cardboard box in a closet for the active fermentation part, as a precautionary measure. I love this type of food preservation because unlike canning, you don’t need to sterilize your jars or worry about botulism. Of course, jars, hands, and tools should be clean. But through the fermentation process, the friendly bacteria crowds out any harmful bacteria. The general rule is that if your ferment has gone bad, it will have an unmistakable foul odor that will make you not want to eat it. If you’re new to the adventures of fermenting, you should definitely read up on it in more detail before trying this recipe out. A good place to start is the video on fermentista.us by Kirsten and Christopher Shockey whose Leekchi recipe mine is based on. They have also written an outstanding book called Fermented Vegetables. I also recommend listening to renowned expert Sandor Katz (aka Sandor Kraut!) explain fermentation in this video. I highly recommend his books as well. I hope you’ll give this a try, do let me know how it turns out for you in the comments below. Enjoy! First, rinse the leeks very well. Soil tends to get stuck in between the layers at the part of the leek where the dark leaves begin to branch out. Also, wash your hands well before starting this recipe because you’ll be using them to mix everything together. 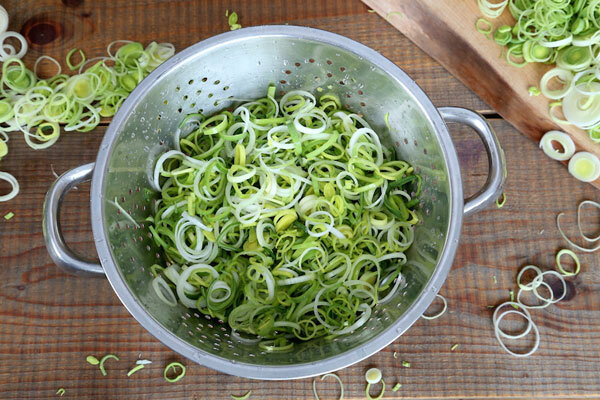 Place the thinly sliced leeks (including some of the green tops) into a large bowl. Sprinkle the salt on top. Use your hands to massage the leeks and salt together until the juices begin to release (about 5 minutes). 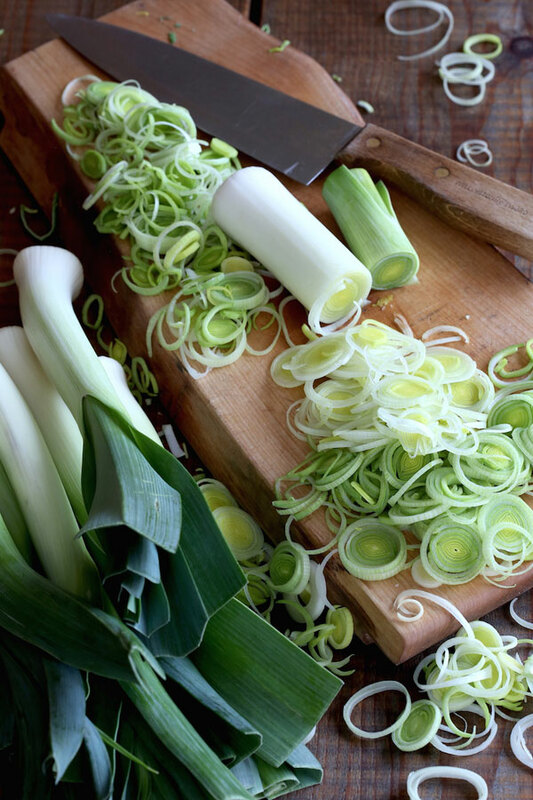 Cover the sliced leeks and allow them to rest for about 45 minutes so the juices continue to release. Add all of your flavoring ingredients: minced garlic, grated ginger, and hot pepper. Mix well until fully incorporated. 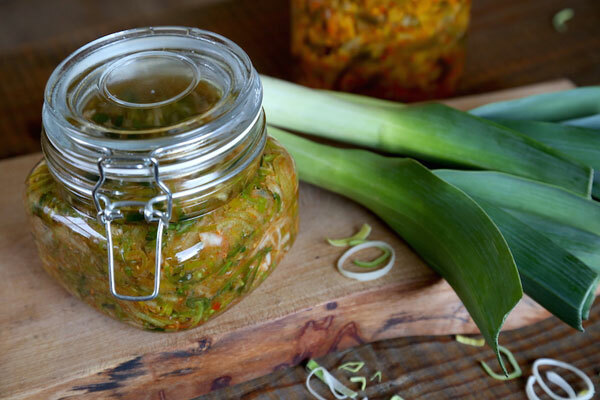 Press the leek mixture into a clean 2-quart mason jar or crock, or a 1-quart jar if using a clamp-down Fido or Le Parfait jar. In order to ferment vegetables properly, you must keep them submerged under liquid. You’ll want to compress the leeks down to remove all air pockets and to encourage their juices to rise to the top, really packing them down. If you don't have a wooden tamper, you can use the back of your hand or the end of a wooden spoon or rolling pin to press down. If you've pressed the leeks down but there is still not enough liquid to cover them, you can add a bit of homemade brine. Stir 1 tsp salt into 1 cup water until the salt has dissolved. Pour just enough of this brine on top of your leek mixture to cover it. The fermentation process will push the leeks up out of the brine so you may need to weigh them down, depending on the vessel you’re using. If using a mason jar or a crock, top your leeks with a follower and weight combination or use a simple weight made out of a quart-sized ziplock bag. Press the plastic down onto the top of the ferment, then fill it with water and seal. For a jar, screw the lid loosely on top. Do not seal so that gases can escape during the fermenting process. Clamp-on jars such as Fido and LeParfait do not need a weight to keep the vegetables submerged because they can remain closed until the ferment is ready to eat. However, if using this technique, be aware of the small risk that a jar can shatter, as explained in my write-up above. Though this is unlikely, you should wrap any jars in rags or towels and place them in a closed cardboard box in a closet for the active fermentation part, as a safety measure. This article has additional information about how to keep ferments submerged. Leave your leekchi at room temperature, away from direct sunlight for about 1 week. The contents may bubble and seep out so you may want to keep your jars on some newspaper. Unless you are using the clamp-down jar option, you should check your ferment daily to ensure the vegetables are still submerged under brine. Scoop out any scum that develops on the top. Your leekchi is ready when it has turned yellowish, the leeks have softened and developed a nice sour aroma. After about 7 days, the active part of the fermentation should be complete and you can move your jar or crock to the fridge where they will keep for about 6 months. 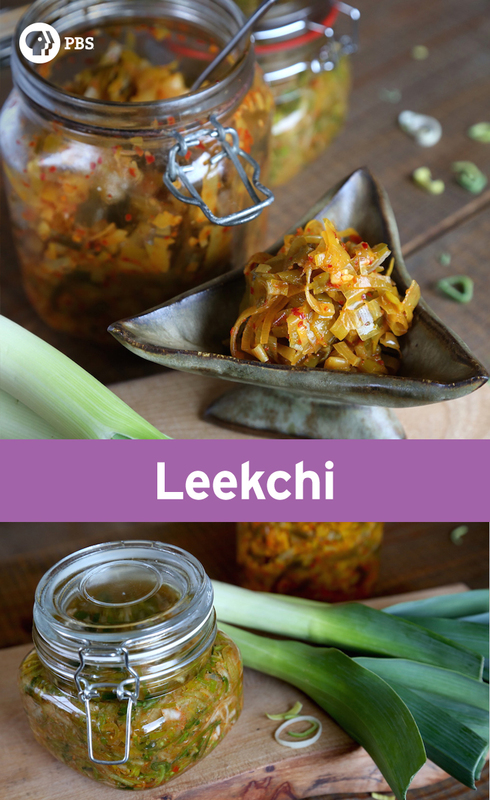 Leekchi is wonderful as a condiment served alongside a warm meal. It’s also lovely with cheese and crackers. 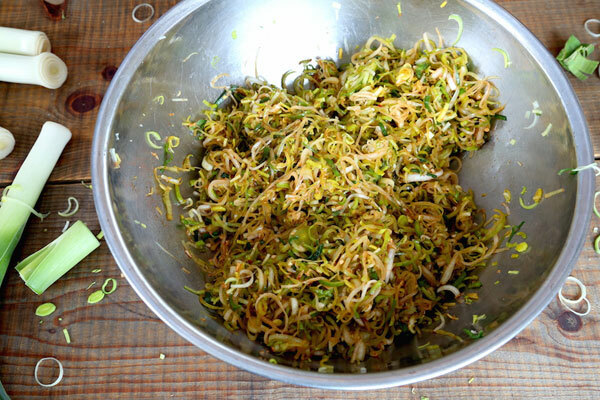 You can add it to stir-fry’s, soups, omelettes or scrambled eggs. If you’re new to fermenting or feeling nervous about the process, consider investing in an airlock system. This is the optimal way to ferment. Some companies that sell airlock kits include: Pickl-it and Go Ferment. Once you get comfortable with the base recipe, you can use special add-ons such as sesame seeds, seaweed flakes, fish sauce, smokey chipotle or paprika, gourmet salts etc… Feel free to experiment with these types of add-ons and personalize your leekchi to suit your taste.